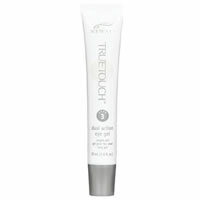 True Touch Dual Action Eye Gel replaces Circles & Lines. Minimises the appearance of dark circles, puffiness, and reduces the appearance of fine lines and wrinkles. TrueTouch® Dual Action Eye Gel is a dual-action formula that minimises the appearance of dark circles, and addresses under-eye puffiness for a visibly brighter-looking eye. Featuring concentrated botanical extracts and proteins, this targeted eye gel protects the skin around the eyes, and reduces the appearance of fine lines and wrinkles while promoting firmer, more resilient-looking skin. Minimises the appearance of dark circles and addresses under-eye puffiness to lighten and brighten the look of the eye. Moisturises and reduces the appearance of fine lines and wrinkles around the eye. Formulated to encourage the delivery of action ingredients to the skin, maximizing potential benefits. Gently apply small amount under eye. Use prior to Protect Am or Renew PM. Hydrolyzed Elastin—a lower molecular sized skin revitalising agent. It rejuvenates and smoothes skin’s appearance, maintaining the look of elasticity and firmness. Water (aqua), isopentyldiol, biosaccharide gum-1, hydroxyethyl urea, ammonium acryloyldimethyltaurate/VP copolymer, acanthopanax senticosus (eleuthero) root extract, glucosamine HCI, aloe barbendensis leaf juice, caprylyl glycol, pisum sativum (pea) extract, saccharomyces cerevisiae extract, hydrolyzed lupine protein, medicago stavia (alfalfa) seed extract, butylene glycol, hydrolyzed elastin, camellia sinensis leaf extract, hibiscus sabdariffa flower extract, panax ginseng root extract, roamarinus officinalis (rosemary) leaf extract, disodium EDTA, phenoxyethanol, chlorphenesin.